Originally designed as a magazine cover, James Montgomery Flagg's image of Uncle Sam soon became the "most famous poster in the world," with 4 million copies printed in 1917 alone. The First World War was a total war. In previous wars, the civilian population tried to steer clear of the war effort. Surely expectations were placed on civilians for food and clothing, and of course, since the 19th century, troops were conscripted from the general population. But modern communication and warfare required an all-out effort from the entire population. New weapons technology required excess fuel and industrial capacity. The economic costs of 20th century warfare dwarfed earlier wars, therefore extensive revenue raising was essential. Without the support of the whole population, failure was certain. Governments used every new communications technology imaginable to spread pro-war propaganda. American efforts geared to winning World War I amounted to nothing less than a national machine. Once Congress declared war, President Wilson quickly created the Committee on Public Information under the direction of George Creel. Creel used every possible medium imaginable to raise American consciousness. Creel organized rallies and parades. He commissioned George M. Cohan to write patriotic songs intended to stoke the fires of American nationalism. Indeed, "Over There" became an overnight standard. James Montgomery Flagg illustrated dozens of posters urging Americans to do everything from preserving coal to enlisting in the service. 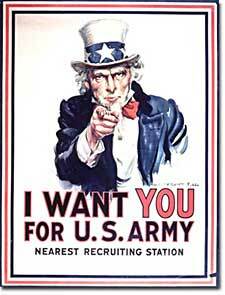 Flagg depicted a serious Uncle Sam staring at young American men declaring "I Want You for the U.S. Army." His powerful images were hard to resist. An army of "four-minute men" swept the nation making short, but poignant, powerful speeches. Films and plays added to the fervor. The Creel Committee effectively raised national spirit and engaged millions of Americans in the business of winning the war. Still there were dissenters. The American Socialist Party condemned the war effort. Irish-Americans often displayed contempt for the British ally. Millions of immigrants from Germany and Austria-Hungary were forced to support initiatives that could destroy their homelands. But this dissent was rather small. Nevertheless, the government stifled wartime opposition by law with the passing of the Espionage and Sedition Acts of 1917. Anyone found guilty of criticizing the government war policy or hindering wartime directives could be sent to jail. Many cried that this was a flagrant violation of precious civil liberties, including the right to free speech. The Supreme Court handed down a landmark decision on this issue in the Schenck v. United States verdict. The majority court opinion ruled that should an individual's free speech present a "clear and present danger" to others, the government could impose restrictions or penalties. Schenck was arrested for sabotaging the draft. The Court ruled that his behavior endangered thousands of American lives and upheld his jail sentence. Socialist Party leader Eugene V. Debs was imprisoned and ran for President from his jail cell in 1920. He polled nearly a million votes. There was a sinister side to the war hysteria. Many Americans could not discern between enemies abroad and enemies at home. German-Americans became targets for countless hate crimes. On a local level, schoolchildren were pummeled on schoolyards, and yellow paint was splashed on front doors. One German-American was lynched by a mob in Collinsville, Illinois, only to be found innocent by a sympathetic jury. Colleges and high schools stopped teaching the German language. The city of Cincinnati banned pretzels, and esteemed city orchestras refused to play music by German composers. Hamburgers, sauerkraut, and frankfurters became known as liberty meat, liberty cabbage, and hot dogs. The temperance movement received a boost by linking beer drinking with support for Germany. These undeserved crimes against innocent German-Americans went completely unpunished. Once support for the war was in full swing, the population was mobilized to produce war materiel. In 1917, the War Industries Board was established to coordinate production of munitions and supplies. The board was empowered to allocate raw materials and determine what products would be given high priority. Women shifted jobs from domestic service to heavy industry to compensate for the labor shortage owing to military service. African Americans flocked northward in greater and greater numbers in the hope of winning industry jobs. Herbert Hoover was appointed to head the Food Administration. Shortages of food in the Allied countries had led to shortages and rationing all across Western Europe. Hoover decided upon a plan that would raise the necessary foodstuffs by voluntary means. Americans were encouraged to participate in "Meatless Mondays" and "Wheatless Wednesdays." Additional food could be raised by planting "victory gardens" in small backyard patches or even in window boxes on fire escapes. President Wilson showed his support by allowing a flock of sheep to graze on the White House lawn. Similar measures were employed by the Fuel Administration. The government also adopted Daylight Savings Time to conserve energy. 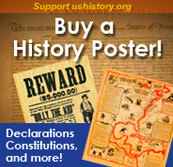 World War I was the most expensive endeavor by the United States up to that point in history. The total cost to the American public amounted to over $110 billion. 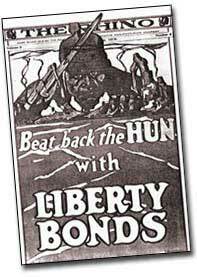 Five successful Liberty bond drives raised about two-thirds of that sum. Of course, bonds are loans to be paid by future generations. The first income tax under the Sixteenth Amendment was levied. The tax rate at the top level was 70%. All in all, great sacrifices were made on behalf of the United States people in their venture to make the world safe for democracy. The famous American Ace Captain Eddie Rickenbacker was one of the Commanders of the 94th "Hat-in-the-Ring" Squadron, credited with more air victories than any other American squadron. Here is the full text of his exciting and highly readable memoirs. There's a bonus of several good images. A look at propaganda, its forms and past and current political uses, with a special look at propaganda employed by both sides during World War I. This could be a dull topic, but the author keeps it interesting. Did you know that comedian George Carlin coined the phrase "shell shock"? An intuitive table of contents takes you where you want to go quickly, but you may want to read every word. This tribute to jazz band leader Lt. James Reese Europe includes audio files of his "Hell Fighters" Band. Unlike other Tin Pan Alley composers of the day, Europe experienced battle which gave authenticity to his music. This webpage offers an interesting interpretation of "How 'ya Gonna Keep 'em Down On The Farm? "and some nice images. This brief biography of General Pershing includes a sound clip from one of his addresses "from the battlefields of France. What a resource! Yes, hundreds of documents, including all 440 articles of the Treaty of Versailles, are accessible from the library at Brigham Young University, along with memorials and personal reminiscences. But there's much more. The University of Kansas hosts webpages with over 1400 photos, categorized for easy access, a section on WWI medals, and nearly 50 articles of special interest, such as the secret Black Hand society and American Indian involvement in the Great War. This website, a companion to the PBS film "Influenza 1918," chronicles the spread of the epidemic that killed over 600,000 Americans and spread quickly throughout the rest of the world. Read the full transcript of the film or review the resources including a detailed timeline and an animated map that shows the spread of the disease across the United States. Three thousand miles from home, an American army is fighting for you. Everything you hold worthwhile is at stake. -General Pershing to the American public. In March 1918, 84,000 American "dough-boys" left for Europe, followed by 118,000 more a month later. They carried with them a virus that would prove to be far more deadly than their rifles.